"... a squat contrivance looking much more like a frog than a camel. 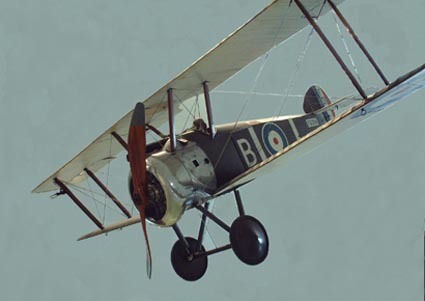 I gazed with awe into the cockpit ..."
anonymous RFC Camel pilot 1917, quoted by H F King in his book Sopwith Aircraft. 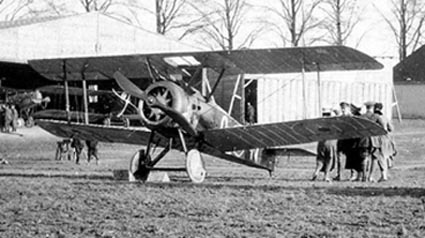 The Camel single-seat fighter first deployed with the RNAS in mid 1917 and deliveries to the RFC followed quickly with 70 Sqn equipping in late July. The aircraft's name is said to have come from the hump on the cowling above the engine which encased twin Vickers machine guns. 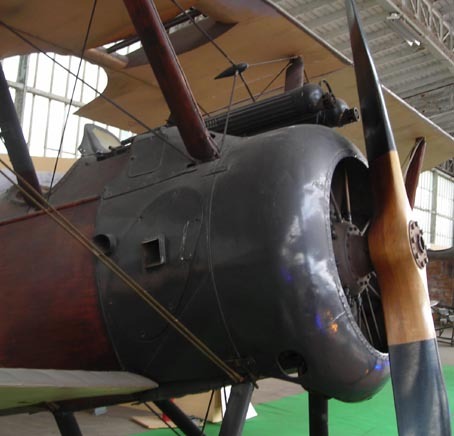 The Camel was the first British fighter to mount a twin Vickers gun arrangement and was equipped with the Sopwith-Kauper synchronization gear and later the more efficient Constantinesco or CC gear (used on the 110 hp Le Rhône). Various modifications were made including the fitting of opposite handed feed-blocks (replacing the original standard right handed feeds) and the Hazleton attachment or "speeding-up set" which doubled the rate of fire to around 1500 rounds a minute for the two guns combined. The Camel's "hump" from which the twin Vickers guns protrude. The Camel, equipped predominantly with 130 hp Le Clerget or 110 hp Le Rhône rotary engines, was an unstable platform requiring continuous pilot attention and was consequently highly manoeuvreable. It was notable for its rate of climb rather than level speed and for its rapid right hand turn derived from the gyroscopic effect of the engine. It became a highly successful fighter with 1200 or so victory claims by Camel pilots. It was also used extensively in ground attack roles armed with four Cooper or Hales 20-25lb bombs. Initial RFC Squadrons equipped with Camels (in order of appearance) : 70 Sqn end of Jul 1917, 44 Sqn Aug 1917, 45 Sqn Sep 1917, 43 Sqn Oct 1917, 28 Sqn Oct 1917, 80 Sqn Dec 1917. Total production of Camel F1s was in the order of 5,500. Wingspan 28', length 18' 9", height 8' 6''. Take off weight with full load approx 1,453 lbs.